We all take our kidneys for granted. There they sit; one on each side of our spine in the mid back region just under the ribcage, looking like fist sized red kidney beans. 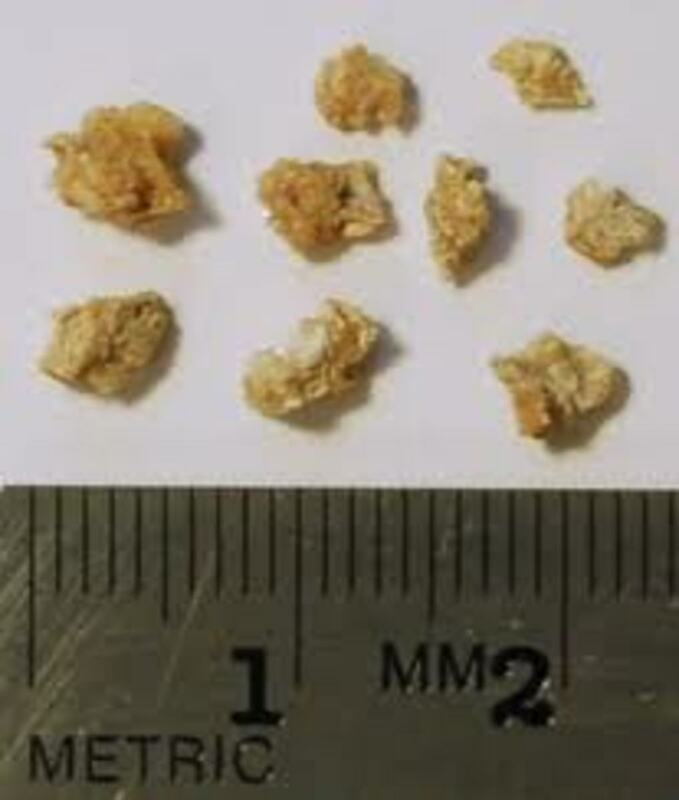 We don’t think about them or wonder exactly what they are doing, and I was the same as everyone else, until I was shocked by an incidental finding of a suspicious cyst on my right kidney. This took me on a journey I was neither prepared for nor understood. In writing this article I hope to give some insight to others whilst handling kidney cancer, its removal and the aftermath. Blood in the urine (haematuria): This is the most obvious cause for concern. The problem is that this can be a sign of other problems such as kidney stones, an infection or a prostate problem. There may be such minute amounts of blood in the urine that it is simply not observed by you but other times it may be very obvious. Any blood in the urine that you do see should always be checked out with your doctor immediately. General ill health: Tiredness, loss of appetite, weight loss, sweating or high temperature are the more vague symptoms and can be indicative of many other health problems. I felt generally unwell and was so tired that I had to take short naps during the day. I also had bouts of severe nausea and thus my appetite decreased and I lost weight. My acid reflux was playing up at the time and I must admit to putting most of my symptoms down to this. Eventually I went to my doctor who also put it down to my acid reflux. I had blood tests to ensure everything was ok because of the utter tiredness I felt. All tests came back with no negative results. After repeated visits to my doctor and with no sign of the symptoms abating, I was finally admitted to hospital for investigation. 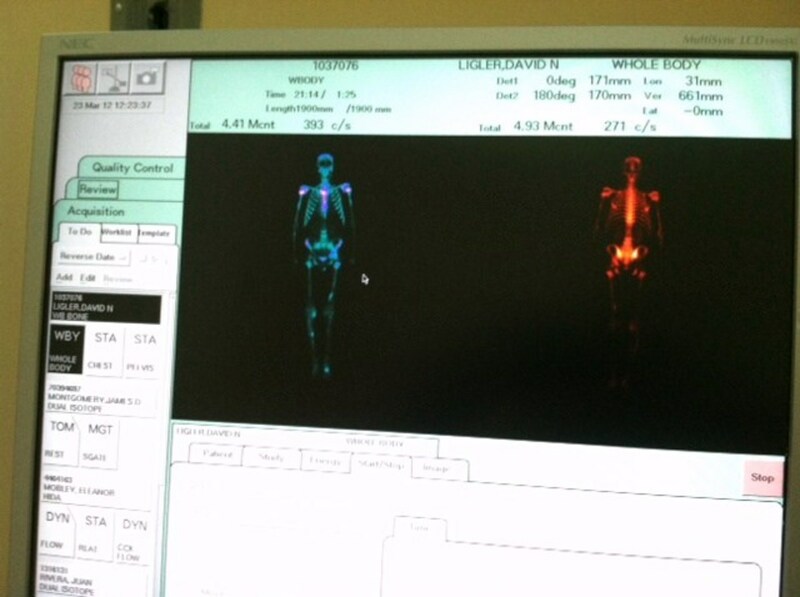 I had blood tests, a chest x-ray, an endoscopy and a CT scan. The blood tests were fine as was the x-ray. The endoscopy showed acid reflux but nothing of more importance. The CT scan showed that I had a 2.6cm cyst on my right kidney. I asked if this was innocent and was told it most probably was a benign cyst but I would have to see a urologist to have it checked out. An urologist came to see me the same day and didn’t hold back! He told me that it could be cancerous and that I needed an MRI scan as an outpatient. I was then discharged from hospital. 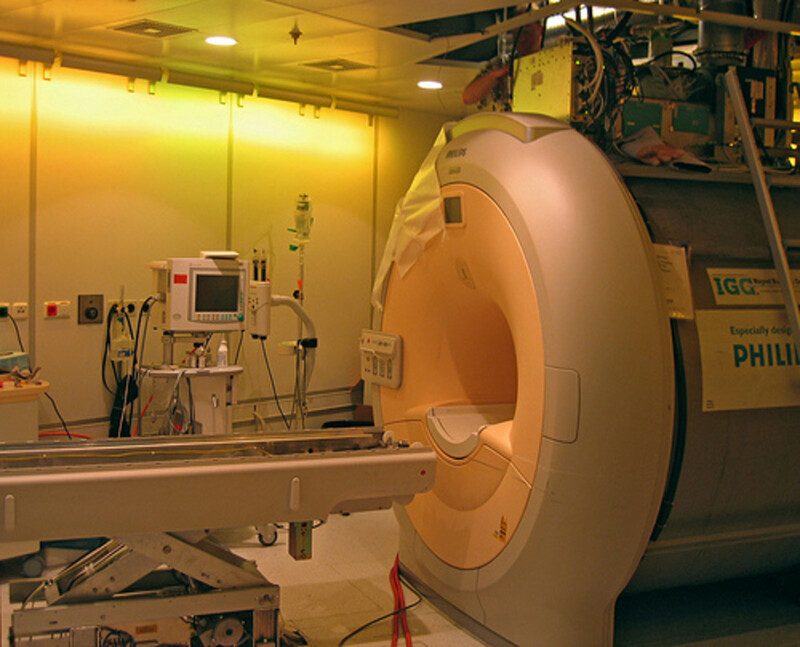 I had to wait several weeks for my MRI scan appointment with a suspected cancer and I became increasingly worried. 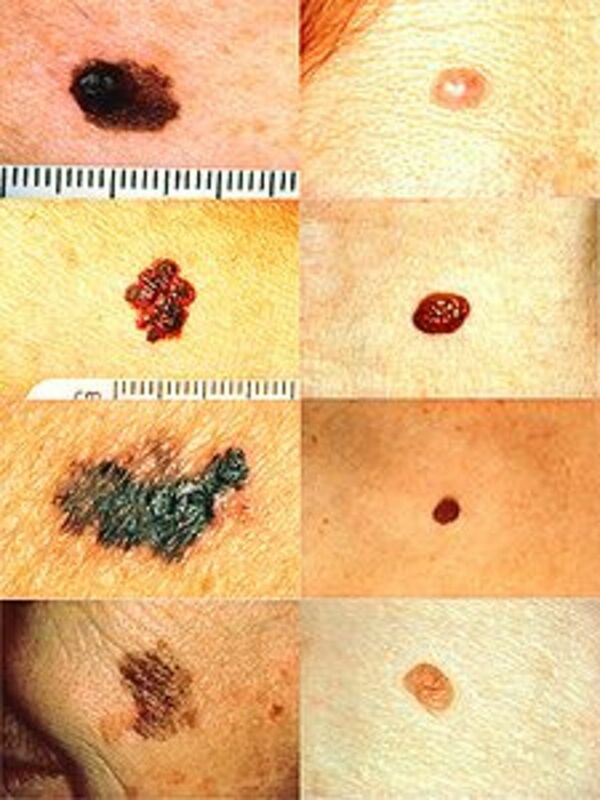 It’s amazing what the word “cancer” does to a person. I had gone cold when the urologist mentioned the word but the not knowing if the cyst was benign or cancerous was harrowing. I had the MRI scan which wasn’t pleasant as I am somewhat claustrophobic, and then I waited two more weeks to be given a hospital appointment for the results. After more waiting and worrying, I was told that I had something called a Bozniak cyst grade three. The words suspicious and sinister were used to describe it and I was told it simply had to be taken out as the probability of it being cancerous had now risen. The reality was beginning to hit me big time! This wasn’t so much of a maybe any more, and after another ultrasound scan I was booked in two weeks later for a radical nephrectomy. When you have a suspicious cyst that is most probably cancerous, you are offered a full kidney removal (radical nephrectomy) or a partial kidney removal (partial nephrectomy). The size of the cyst and its position may indicate the best operation. Mine was bang in the middle of the kidney but by kidney cyst standards was not huge. I was offered a partial nephrectomy which could be done by either open surgery or keyhole surgery (laparoscopic surgery). I was also offered a full or radical nephrectomy by open surgery or keyhole surgery. 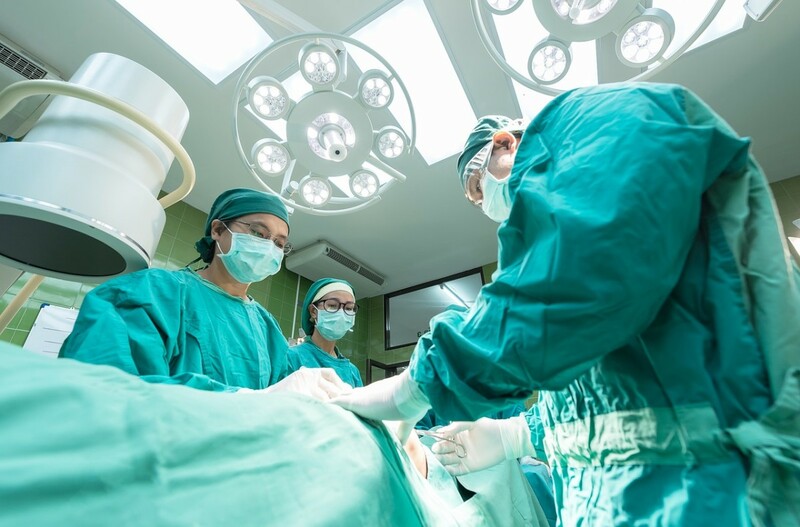 I was so concerned at the thought of the possibility of some cancer remaining, and the possibility of a further operation, that I chose a radical nephrectomy performed by keyhole surgery. I decided I would live with one kidney! 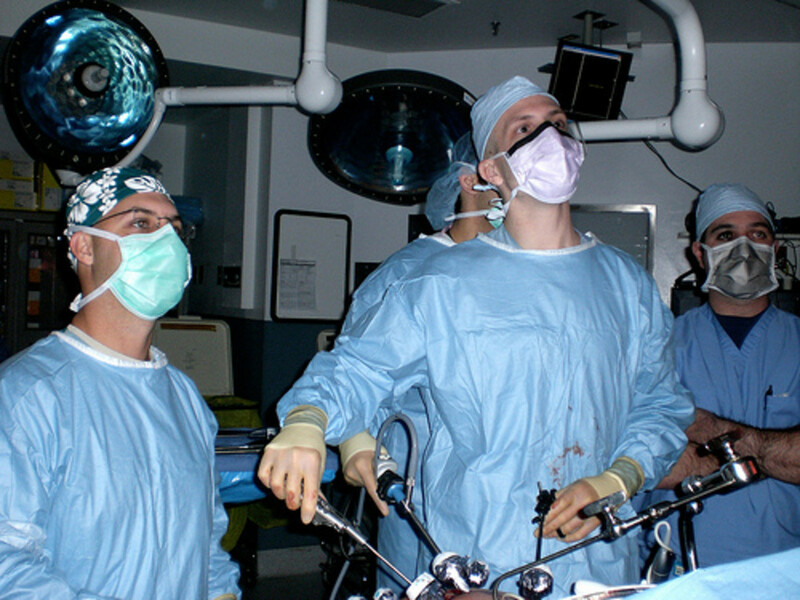 A radical nephrectomy without complications should take around three to four hours to perform. Mine took around three and a half hours. I awoke to find a drainage tube in my back and I had been catheterized. I am not going to try to describe the pain because there are no words to describe it! I was offered morphine but was terribly sick on it. 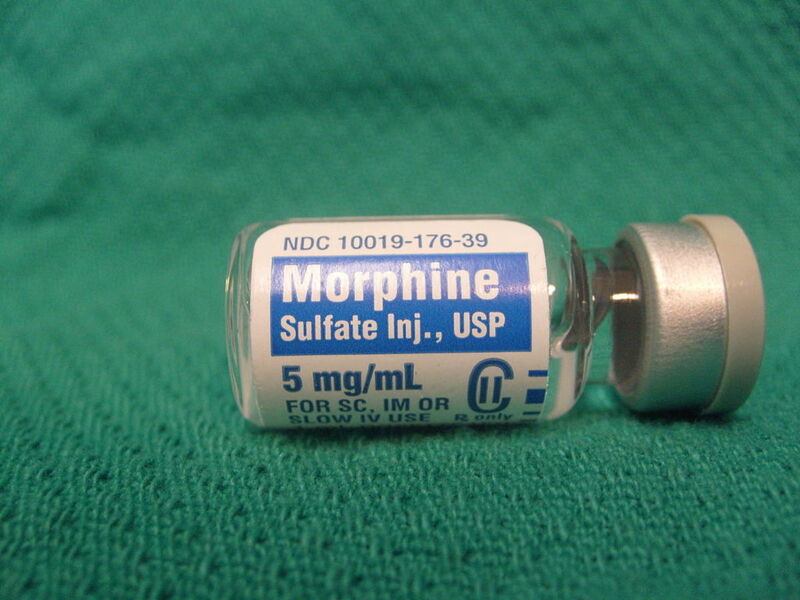 Retching with fresh scars and internal pain is no joke, so I said I would manage without morphine thank you very much! My oxygen levels were fluctuating and mostly quite low for around twelve hours and I had to use an oxygen face mask for that time. I was told this was quite normal after this operation. There is actually a risk that your lung can get nicked during the operation but this didn’t happen to me. Within 24 hours I was reluctantly sitting out of bed and within 48 hours I was ordered down to the bathroom for a shower. My surgeon visited me to say everything had gone well, and that he would see me in clinic in four weeks time. Apart from severe pain and utter tiredness, everything seemed ok. Moving around wasn’t easy but I felt relieved to have the operation over with. 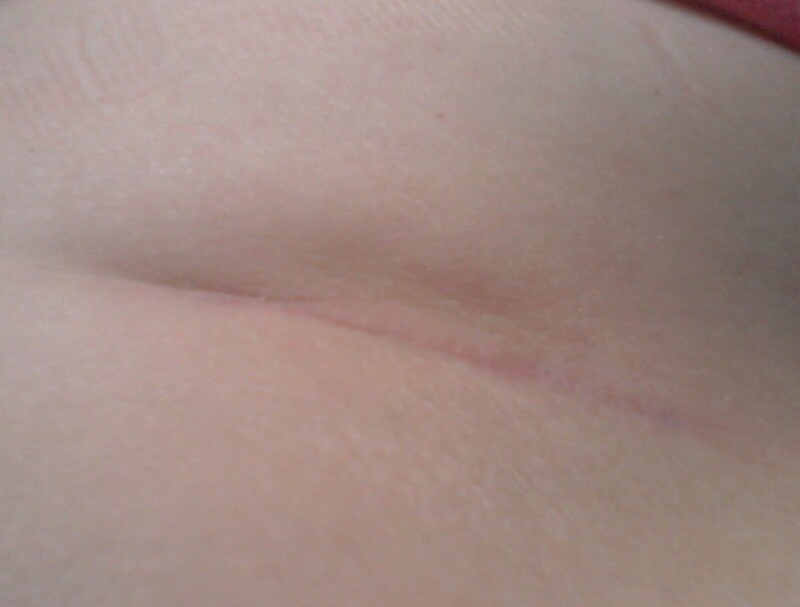 I was amazed at the three inch scar in my lower abdomen where my whole kidney had passed out of my body. 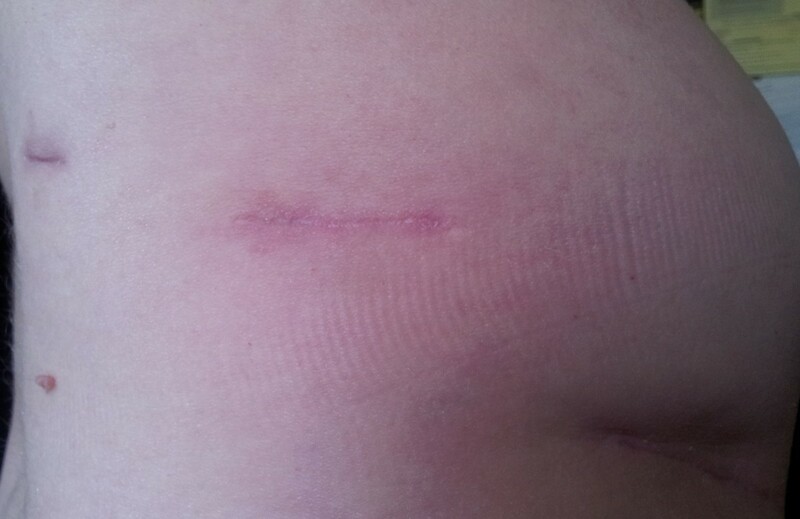 I couldn’t see my other two scars as they were on my back. The catheter and drain were removed at the end of the second day. My stay in hospital lasted four days. When I had my appendix taken out at the age of twelve, some forty years ago, I was in hospital for a week! After my nephrectomy, I went home with extreme pain and weakness, but was told to keep moving about between rests and to make sure I drank plenty of fluids. I am now ten weeks post operation and it has been a difficult time, but this is a major operation and it is early days. I still have a sizeable swelling on my side that has taken my waist size up two notches and have had to buy some bigger clothes. My pain has lessened by around fifty per cent but my tiredness lingers on. No one mentioned the awful nerve pain you get too, which I find to be so irritating. Apparently this will improve but may never totally go away. I find I get breathless after walking a couple of hundred meters and still have to pace myself in what I do. From talking to many others on the internet that have had a nephrectomy, recovery time is different, but lots of people do take several months to feel anything like their old selves. Apparently it takes over a year for the internal trauma to heal. There is a risk of a clot developing after surgery so I had to wear surgical stockings for six weeks. Tiredness seems to be my main issue now. My cyst was cancerous but thankfully the results are favourable. I was told I had a very slow growing cancer and that it could actually have been growing on my kidney for six years or more! My adrenal gland was removed along with the kidney but I am told that the other adrenal gland will do the work of two. Now I have to have six monthly chest x-rays and ultrasound scans for a couple of years, then yearly after that. There is a ninety per cent chance my cancer will not come back in the next five years. I was told my original symptoms had not indicated this cancer, and that most cancers in the kidney are found incidentally when looking for something else on scans. We simply would not know of their presence until an advanced stage in some cases. Some people are born with one kidney and their lives are fairly unaffected by this. 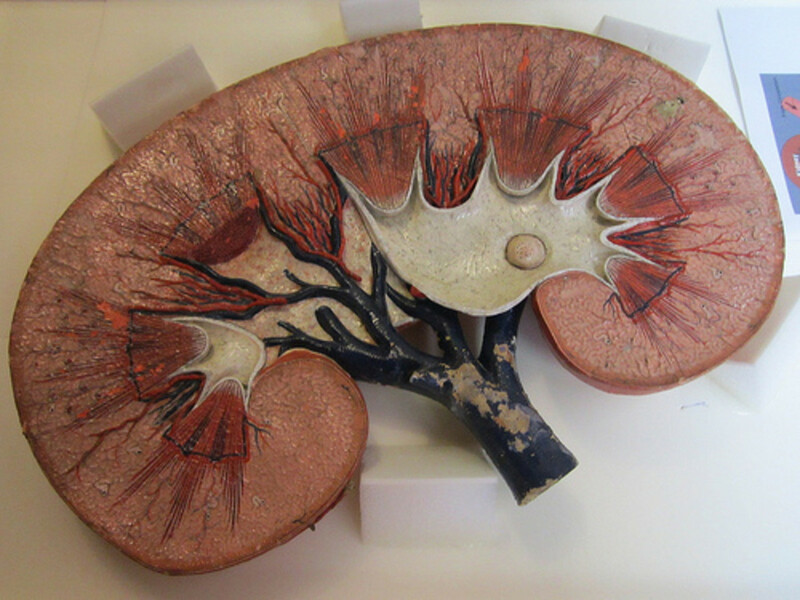 Others offer their kidney for transplant, safe in the knowledge that their other kidney will do the work of two. 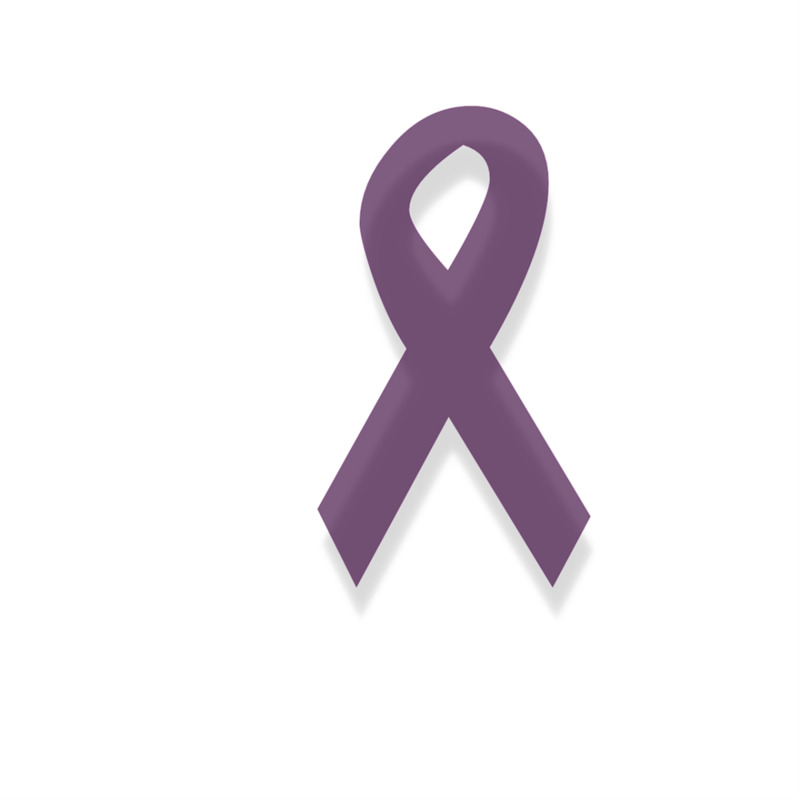 Losing one to cancer is not ideal and makes for a very worrying time, but there is often a great outcome for those whose cancer has been contained in the kidney. I'm also a witness to kidney removed, I have experience pain on multiples of different levels. I'm managing the best way I know how. But reading this passage made sense, and that's the same way I feel. It eases my mind to know some one else feels the same way I felt. This is serious and most of real. Thank you. I wish you a haste recovery, meloncauli. I guess it's always wise to wait before considering to donate a kidney while you're still alive. Hi. I do hope you see some improvement soon. Its certainly a much slower process to feeling healthy than they would have you think. 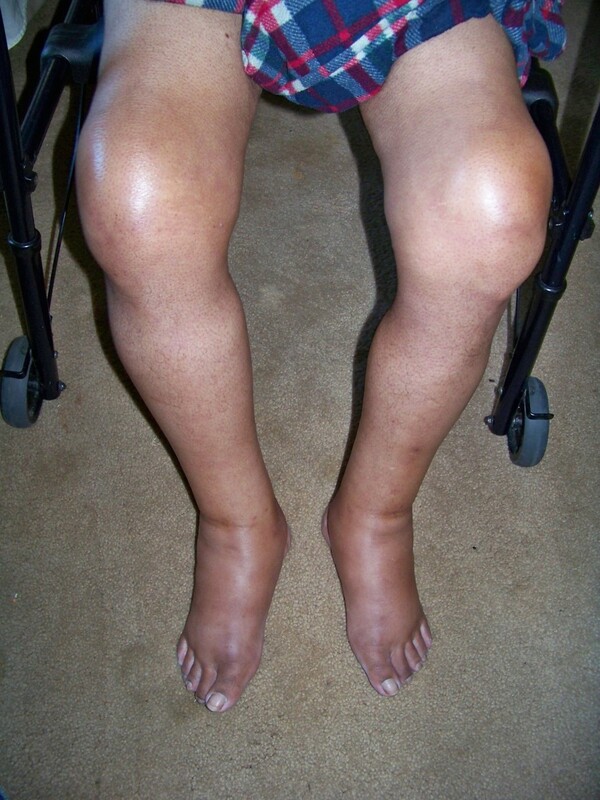 I have other chronic conditions, and since my nephrectomy those have got worse. Some medications I could take for those, I can now only take a low dose of or not at all now...to preserve my one kidney. I am managing to keep its function quite good though. Take it easy and as I said, I hope things improve for you. Good luck with your next tests. Gosh, at last, someone to relate to. I am in a pickle here not knowing how I am to feel, I am so drained, and yes, I have two other "monster" conditions to deal with but I know my body and just feel utterly depleted. 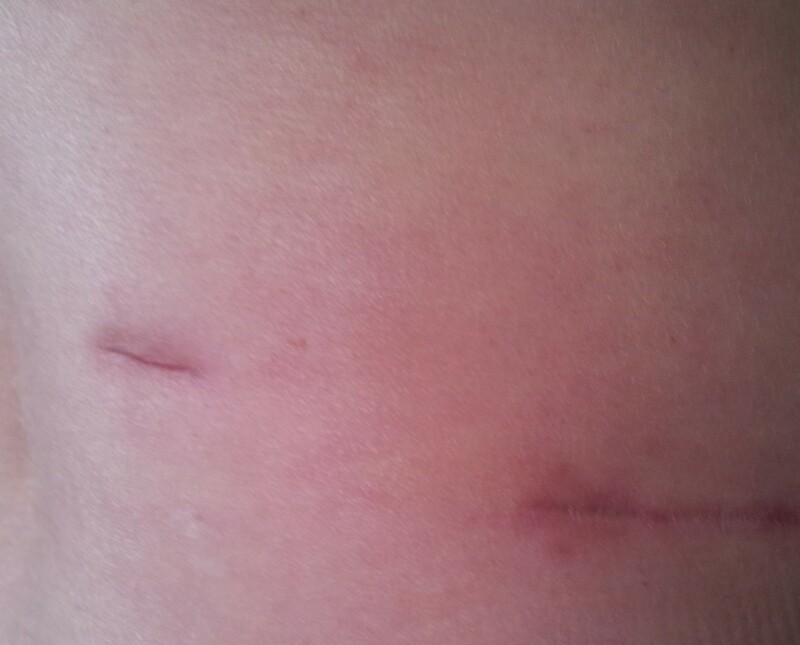 I had Radical Nephrectomy just under 5 weeks ago. I coped with it all without any pain medicines too. There was so much anesthesia to eradicate after I felt truly poisoned. I eat well, take gentle exercise, move lots, and drink water and herbal teas to help the remaining kidney function to its fullest. I do feel viciously nausea though, all the time, it was a little better for about the second week after surgery and then it came back with a vengeance. I do wish I could feel better, that breeds hope, but I know the cancer is out, or at least most, another scan in November to see about a suspicious lymph node. I hope you are so much stronger since this, thank you, you are a blessing. Thank you. I have just undergone a partial nephrectomy of the left kidney only 4 days ago and now have the agonising wait for the results. Mine was under surveillance for 3 years before it was deemed necessary to remove it. 6cm was the size and done as an open surgery. The long road to recovery is now on. This advice is invaluable. Well done. Wow, Meloncauli, you've clearly been through a horrendous experience, yet told the story with sincerity and your usual clarity. Wishing you every success in your recovery and I look forward to many more of your excellent hubs in the future. Thanks for your comment innerspin! Glad to hear your hairdresser is doing well...gives me even more hope. I can see why you chose to have the whole kidney removed, think I'd have made the same choice. Hopefully your health will continue to improve. My hairdresser had a kidney out a couple of years ago due to a cyst, she's doing really well. Thanks for sharing your interesting story. Thanks for the comment Linda. I never had a kidney infection in my life but know that its painful. Keep drinking that water! Thanks Om. I am pleased he got a transplant. I have a family member who was born with one kidney and has few problems so that gave me hope after the operation. Wow, you were so fortunate they detected the cancer early enough. What an incredible ordeal you've been through. I'm glad you are making progress in your recovery and hope you get your energy level back soon. Thanks for sharing your story. You are so right, we never give much thought to our kidneys. 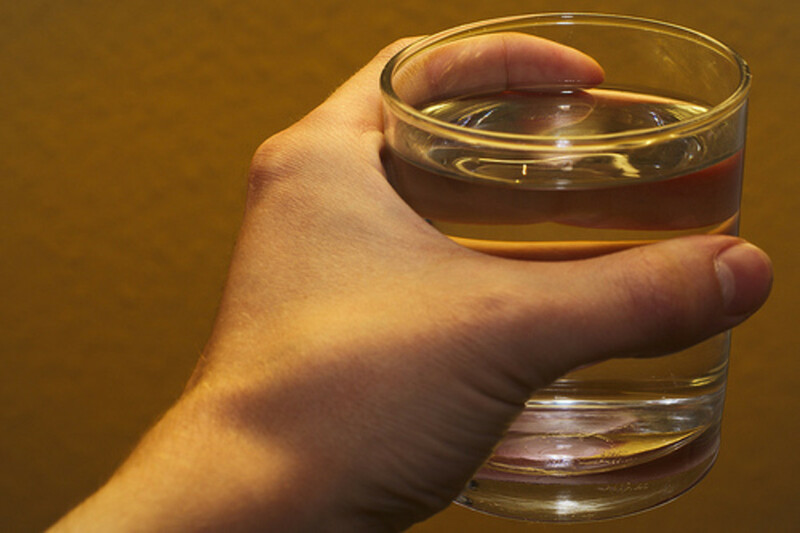 I had a fairly bad kidney infection years ago, so I am hyper aware that I need to take care of them by drinking plenty of water throughout the day. Thanks for sharing your personal experience and knowledge, meloncauli. Best wishes on your recovery. My uncle also had kidney disease (not kidney cancer, though) and had been on Dialysis for a couple years. He finally got a kidney transplant last year. Now he's still not as active as his old self, but he definitely seems a lot healthier and happier. Thanks so much biilybuc. I have much to be grateful for. Fate found the cancer and I consider myself to be lucky. It is so very important when people, like you, share their stories for others so that they might learn. I am happy that the operation went well, and I offer you best wishes on a full recovery. Great hub!